In this article, we will discuss the options available in the event details page when you edit or create a new event type. Event types can be either leave or absence types. 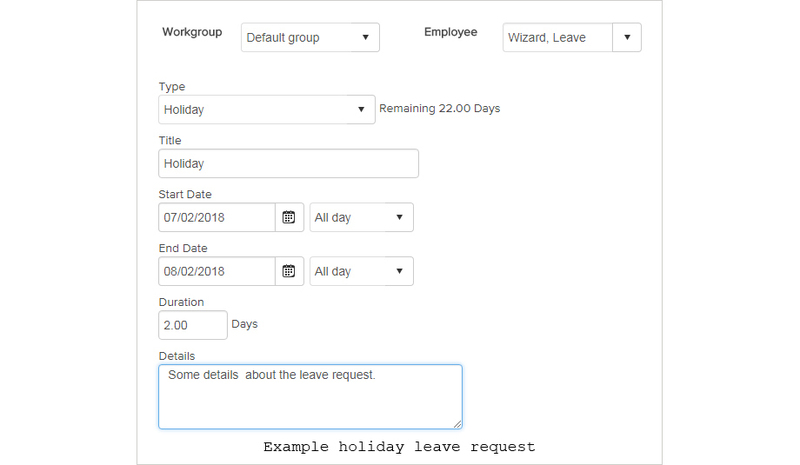 Unlike most other leave management systems, LeaveWizard lets you configure as many leave or absence types as you need, not just holiday or sickness. We will now examine each option and it's associated settings in detail to allow you to configure event types correctly for your company. This section allows you to enter the basic details of your event type. This field allows you to enter a name for the event type. It will be used to refer to the event type throughout LeaveWizard and will be displayed in various lists and reports. This is the name that employees will see when requesting leave and the name that is used when recording an absence. The name chosen should be descriptive, e.g. 'Vocational Training', 'Maternity Leave', etc. to make it clear when to use the event. This setting allows you to select the type of event from a list of 'base leave types' which determine the fundamental behaviour of the event. You can choose if it is a leave or an absence type and whether it has an associated allowance or not. It is important to understand these base types to correctly configure the event. For a detailed explanation of each base type, please refer to the article Base leave types. The currently selected option, in this example 'Allowanced Leave Requires Approval', will be highlighted in the drop down box. This field allows you to specify the default annual allowance for an event. For events recorded in days, the number represents the annual allowance in days, e.g. 20.00 days per annum. For events recorded in hours, the number represents the annual allowance in hours and minutes, e.g. 200h 00m per annum. The entry and display format for this field is dictated by the 'Is hours' tick box. This setting allows you to choose which ordering is applied to this event type when shown in lists. You can choose between 'Alphabetically' and 'Top of list'. Choosing 'Top of the list' will ensure that this event type is always at the top of any list which is useful for frequently used event types. If more than one event type is selected to be 'Top of the list' then these will be ordered alphabetically at the top. This setting allows you to select if events of this type will be recorded in days or hours. Normally, full time employees would have their events recorded in days. But, for part part time employees recording events in hours is often more appropriate. Then when calculating allowances using the periods worked from the employees work pattern (see work patterns), rather than just taking into account days and half days worked, the actual hours worked are used. When 'Record events of this type in' is 'Days', this option becomes available. When ticked, it will restrict requests of this event type to whole days only. The option to select mornings and afternoons will not be displayed. This setting allows you to choose a colour to use on charts and calendars to quickly and easily visually locate and identify an event type. Is active determines whether an event type is active and available or not. When ticked, this setting allows the event to be seen and used normally. When an event type is no longer needed it can be retired by unticking this setting and it will then only be accessible from the company settings, company lists, all event types page. Is archived determined whether users can record new events of this type or not. When ticked, this setting means that it is not possible for users to record any more events of this type although existing events will still be shown on charts and reports. This section allows you to configure how events of this type are displayed and who can see what information. For visibility you can select which LeaveWizard role level, Administrator, Line Manager or Employee, is required to see what information. Everyone with the selected level or above will be able to see the information. For example, if you select 'Line Manager' then only line managers and Administrators will be able to view the information. The examples also show screenshots of the dashboard calendar and the tooltip which appears when you hover the cursor over the event. This setting determines which users can view the event type. The events of this type will not appear on the calendar and no information about the event will be displayed if the user does not have visibility rights due to their role. Being able to view additional information about the leave type is controlled by the 'Allowance visible' and 'Details visible to' settings detailed below (Default: 'Employee'). This setting will additionally allow the user allowances for the event type to be visible on the calendar and elsewhere (Default: 'Employee'). This setting will additionally allow the details or notes entered when requesting leave for the event type to be visible (Default: 'Employee'). This setting allows you to change how the title of the event is displayed on the calendar and on the tooltip. The options are 'Full details' which includes displaying the user name, dates and duration as shown in the previous examples or 'Title Only' which only displays the event type and status (Default: 'Full details'). This setting determines if the event type is available in iCalendar integration. It should be ticked if it is required. This section allows you to place retrictions on how requests are made for the event type. This setting allows you to define the minimum number of days in advance that a user must request an event of this type. If the 'Request in Advance' box is ticked then the minimum number of days of advance notice should be entered into the text box below, e.g. For 7 days advance notice, enter '7'. This setting allows users to make requests for this event type that are in the past. When this box is not ticked, users will not be able to make requests for start dates that are before the date when the request is made. This setting allows this event type to be excluded from restrictions such as when the maximum number of people off at the same time or people who cannot be off at the same time are set. This option is particularily suitable for Appointment types. This setting allows you to restrict the event request to the maximum number of hours or days that will have been accured by the user when the requested start date occurs. For example, for a user with a leave year begining 1st January, and an allowance for that year of 24 days, after 6 months they will have accrued 12 days entitlement. They will therefore be restricted from requesting more than 12 days up to the 1st July. This section allows you to modify settings that change the way carry overs are handled for this event type. Follow this link to find out more about carry overs. This setting allows you to modify the carry over behaviour of this event type. There are three possible settings to choose from using the drop down box. The default behaviour is to use the remaining allowance as the amount to be carried over and then restrict the maximum that can be carried over by using the 'Allowed Carry Over' setting on the 'Event Types And Allowances page. However, if you use a separate leave type just for TOIL which some organisations do, then you may decide to use a different carry over behaviour. This setting means that only the accumulated TOIL allowance will be carried over and the maximum that can be carried over will not be restricted. This setting means that only the accumulated TOIL allowance will be carried over but the maximum that can be carried over will be restricted by the 'Allowed Carry Over' setting. This setting allows you to set the number of days for which the carried over allowance is valid. This section allows you to enable and optionally enforce the selecting cover functionality when a user makes an event request. This setting allows you to enable or disable the selecting cover functionality. If ticked and enabled, a user will get the option to select another user to cover for them when making a event request. This setting, which ticked, allows you to force the user to select cover before the request can be submitted. This section allows you to modify some aspects of the approval functionality for the event type. This setting allows you to specify if the Administrator should be notified when an event of this type is approved. This is useful if an administrator wants to keep track of approvals of a certain type. This setting allows you to specify if leave cancellations need approval or not. This setting allows you to specify if guidance about the recommended action, either to approve or reject the request, should be included in the approval request emails or not. The suggested action will take into account all the restrictions that are in effect regarding the request. This section allows you to create a text message that will be included in every message sent to an employee confirming the submission of their request. This is particularly useful when a company would like to state their leave policy whenever a request is made. This section allows you to configure some other options for the event type. This setting allows you to choose if users can edit events of this type. When ticked, users can edit their leave requests. If not, then they can only cancel and make a new request or ask an Administrator to amend the original request for them. This setting lets you choose if non-working days are recorded for this event type or not. Normally, non-working days are not recorded. For example, if the user works Monday to Friday only, events that include Saturday and Sunday will not be recorded and an event request for Friday to Monday inclusive will be recorded as 2 days only. Recording non-working days can be useful when the event type is used for training and conferences or when there is no allowance associated with the event type. If LeaveWizard is configured to allow overtime requests in the company settings - Overtime/TOIL section, then this setting lets you choose if the user can optionally request TOIL rather than overtime for this event type. This setting lets you choose what allowance is available by default in the following year for this event type. Normally, the default annual allowance value from the 'Annual Allowance' settings field in the 'Event Type Details' section discussed above, will be used. But, when ticked, the users previous allowance (the current year's annual allowance value set for that user) will be used instead. If LeaveWizard is configured to send monthly reports to users in the company settings - notifications section, then this setting lets you choose if the remaining allowance and leave taken for this event type will be included in the monthly allowance report or not. This setting lets you allow the user to optionally deduct the event period from another event type allowance. For example, the user may request 2 days from their Holiday leave type and then later decide to deduct the 2 days from another leave type allowance. This is useful when using an event type for Duvet days. If LeaveWizard is configured to calculate Bradford factor for users in the company settings - Bradford factor section, then this setting lets you choose if this event type should be included in the calculations or not. Normally, the Bradford factor is calculated only for the 'Sickness' absence type but as some organisations have more than one sickness type this allows other sickness types to be included in the calculations.